This week we’re looking at how Orcs handle weapons, and how that’s linked to their Clan names (picture featuring Onna, btw, who dual wields axes – including one that looks less than Orcish, but we’ll get to that eventually…. ❤ ). Time for another patrons only world building post! This week, we’re switching gears from the Gnomes (steampunk pun absolutely intended) and looking at the Orcs a bit – specifically how an average Orc spends their childhood. More catchup time ^^; Thank you for your patience, dear readers, its been a very trying week. Firstly, time for another World Building Wednesday post, then catch-up in order. Since this one fell on a Sunday, we get both Orcish and Gnomish goodness! 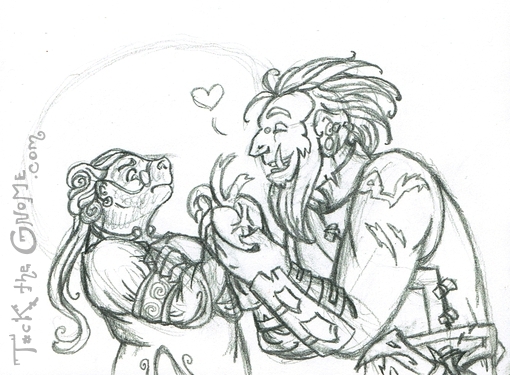 Which inspired me to illustrate two of those current leaders – Queen Adamine of the Gnomes, and Chieftain Keesa of Onna’s as-yet-unnamed tribe (who’s also been featured in the recent pages of the comic!). More on both of them in general, of course, available in the bonus material at Patreon. …..which stumped me at first, but then this hit me very clearly and DEMANDED to be drawn. As far as I can tell, there’s more to this abduction that it seems, and I think that “princess” is going to be just fine. Minor “Rescue Quest” spoilers follow!!! This was inspired by Ursula Vernon’s recent Honey Badger work, by the way, which got me thinking that if things were more…..peaceful between the Brogh and the Orcs, that Orcs would be quite impressed by Honey Badger warriors in particular. Mind you, she’s not disturbed by the bloody organ in front of her. She eats those for breakfast. She is just put off by having said offering right in her face, in the hands of a potential enemy, no less. All content © Rachel Marsh. Do not use, alter or redistribute without permission.